Our first knowledge of Lucas revolved around how artsy this Central Kansas town is known to be. With only this in mind, we began planning our visit. A “must see” we discovered is the Grassroots Art Center, which is located on Main Street. Opened in 1999, this unique attraction occupies the space of three historic native limestone buildings. We would like to thank the Lucas Chamber of Commerce and the Grassroots Art Center for their hospitality. Rest assured all opinions are our own. During a whirlwind day of artistic pursuit, we found our way to the main drag in Lucas. One of our stops was the Grassroots Art Center, but first I needed to do a little social media sharing. It can sometimes be an endeavor to find a strong enough signal to move large photo files, but they have a good spot on a bench outside of the library. While sitting there, we noticed a small group assembling outside of the art center next door. Soon, they started heading down the sidewalk toward us, and when they got to us, the leader asked if we would like to join their excursion. Of course we would. We have learned that if time allows, you should always join in. You just never know what treasures may await. A short march to a home just about a block away brought us to the home of Florence Deeble. 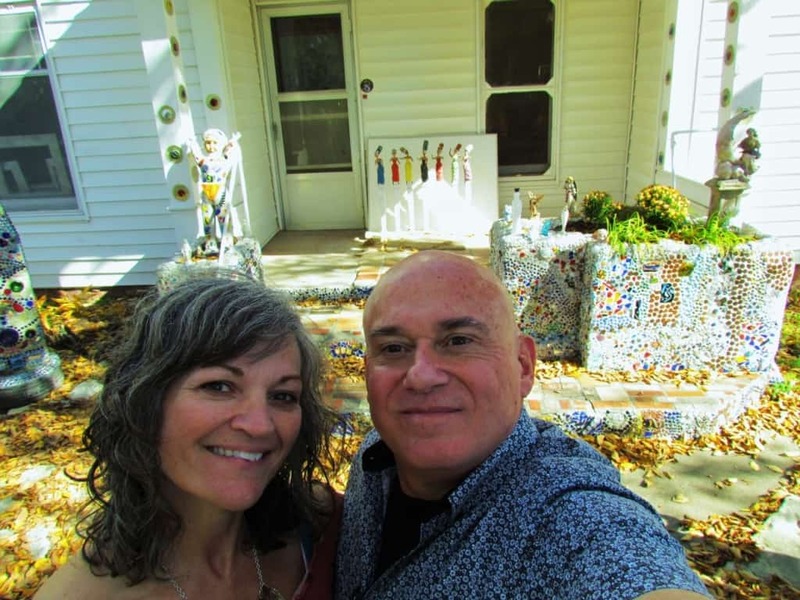 This homegrown artist spent the years, after retiring, creating unique sculptures in her backyard. Our guide walked us through a timeline of Florence’s work, showcasing each piece as she went. It’s amazing the creations she made with concrete and assorted found items. It was like a walk through some of the most memorable sites in America, except in miniature. After the yard tour, we were invited inside to see the artwork of another Kansas artist. 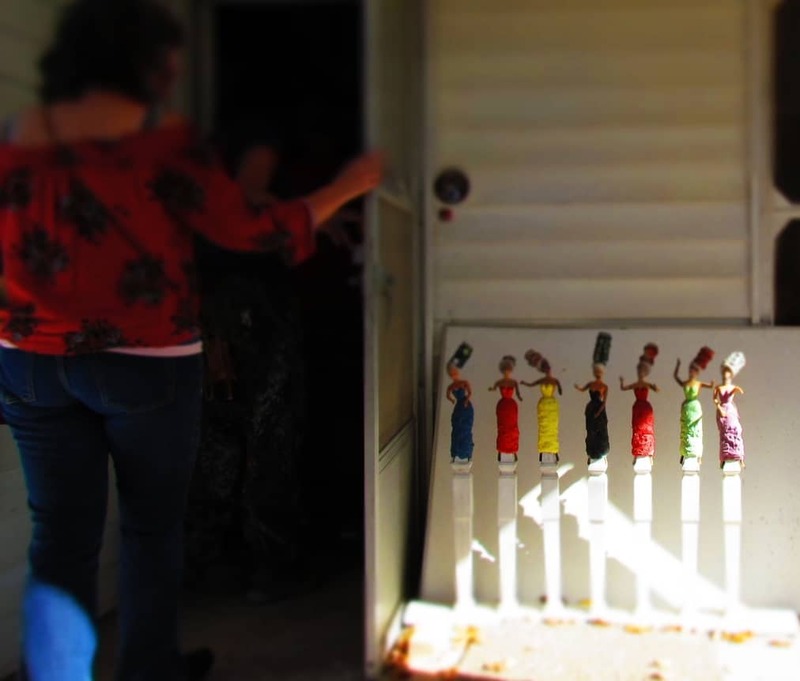 As we passed up the porch steps, an interesting display of Barbie dolls were assembled on spindles. Little did we know, but these spoke a little of what we were about to behold. Once we stepped across the threshold we found ourselves in what can be described as a space-age exhibit space. All of the walls are covered with silver material, so that the artwork stands out as the focal point. It became apparent that Mri-Pilar is a prolific artist, since almost every space was filled with one of her pieces. Statues, sculptures, mosaics, and masks filled the house. Our guide informed us that everything we saw was for sale, and they have plenty of other pieces to replace any we purchased. After wandering from room to room, we found a nice piece to add to our growing art collection at home. When everyone had finished looking around the house, we started back to the Grassroots Art Center. As we walked, our guide pointed out some of the pieces that had been created to adorn the light posts along Main Street. Once back in the art center, we began the second half of the tour. Moving into one of the galleries, we were introduced to a variety of grassroots artist’s works. What we discovered was some amazing pieces that had been assembled out of ordinary materials, but in an extraordinary way. These untrained men and women, many of retirement age, drew from their life experiences to create some unusual art, like the Name Game pictured above. This piece has a large number of pictographs that represent different names. By touching the picture with a pointer, it lights up the appropriate name on the board below. It was fun trying to see how many we could interpret on our own. Our group made a short excursion outside to see the pieces of artwork displayed behind the art center. Back inside, we moved to the Marshall Gallery, which holds pieces created by Inez Marshall. Born in 1907, Inez carved pieces of Kansas limestone into detailed works of art. 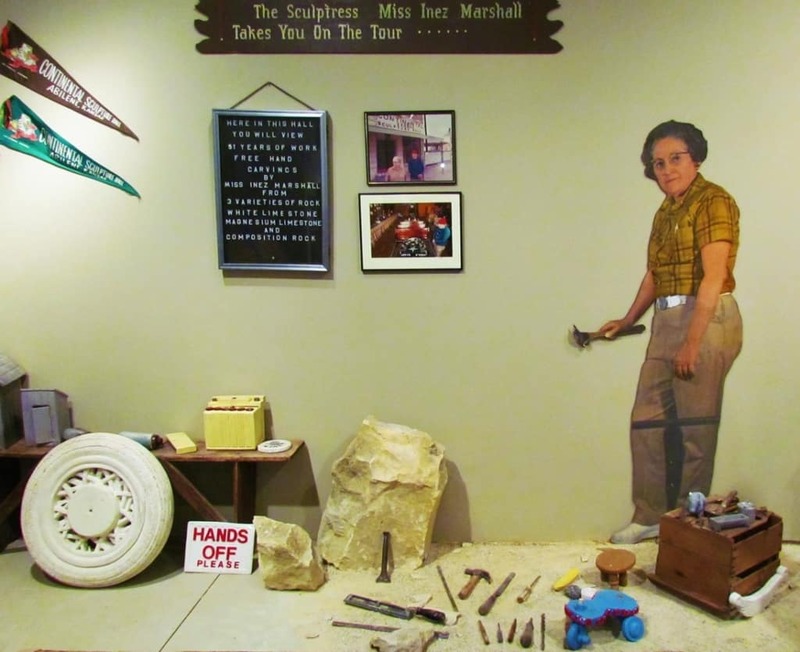 For many of her pieces, she drew from her small town life in Burr Oak, Kansas. Inez would carve for over 50 years, amassing an amazing number of pieces. 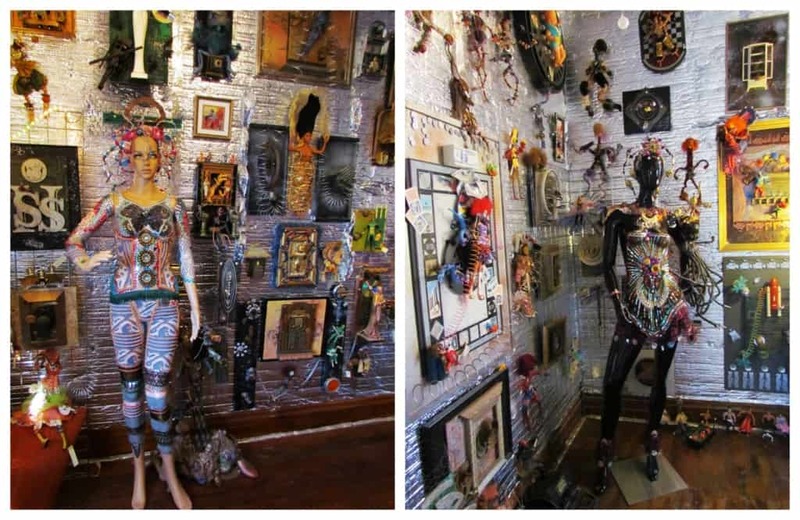 The Grassroots Art Center has almost 100 of her sculptures in their permanent gallery. To think about the difficult task of carving so many details from a piece of native stone is awe inspiring. Once completed, Inez would then paint her pieces to better replicate her vision. A sculpture of a small hospital building becomes even more enchanting when you peek in the windows. Small dioramas fill each space, telling another chapter of the story. While many of her pieces were small enough to easily transport, some were created on a larger scale. A wagon scene seems impossibly detailed to have come from stones, yet there it is to see first hand. Her passion fueled her desire to recreate a wide variety of animals, politicians, still life, and even a one-fifth scale Model T Ford. As we continued through the galleries, we were introduced to the works of more artists. One that certainly caught our attention was this mechanical farm created by Doren Spillman. This self-taught wood carver worked for over 40 years and created hundreds of pieces. He carved many animals and human figures in sizes from around 10″ to full size. The mechanical farm, in the video above, was his only known motorized piece. We had almost made a full circuit, through the Grassroots Art Center, when we came upon the Visitor’s Gallery. 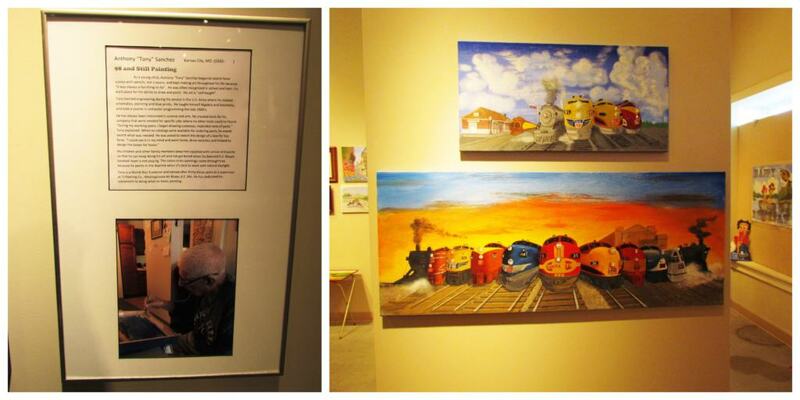 Here they feature a folk artist who’s works are not kept on permanent display. When we visited, it was a Kansas City artist named Tony Sanchez. His paintings had wonderful color and reminded us so much of home. It’s an inspiration to think about him still enjoying this activity at almost 100 years of age. We hope we are still that active when we get there. 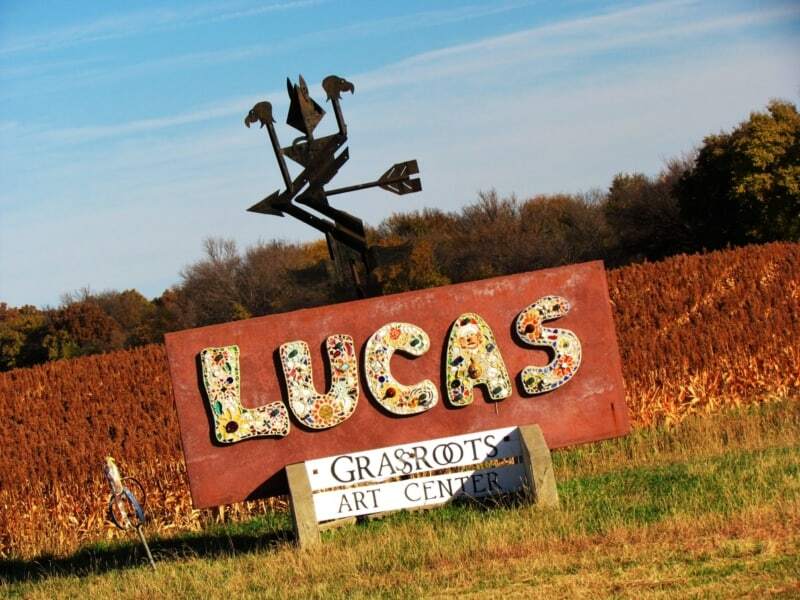 When we first heard of Lucas, Kansas, it was described as an artsy-fartsy community halfway across the state of Kansas. Armed with an itinerary and anticipation, we made our way to this grassroots art mecca. What we found was a community filled with inspired people who see the world around them with unique perspective. This resonates through their art. We also discovered a town filled with warmth and caring individuals who welcomed us with open arms. I wasn’t sure if this trip would yield much in the way of articles, but soon realized that there are a slew of stories in Lucas that have to be told. We are looking forward to sharing more with you in the coming weeks. So what do you think about this unique Kansas town? 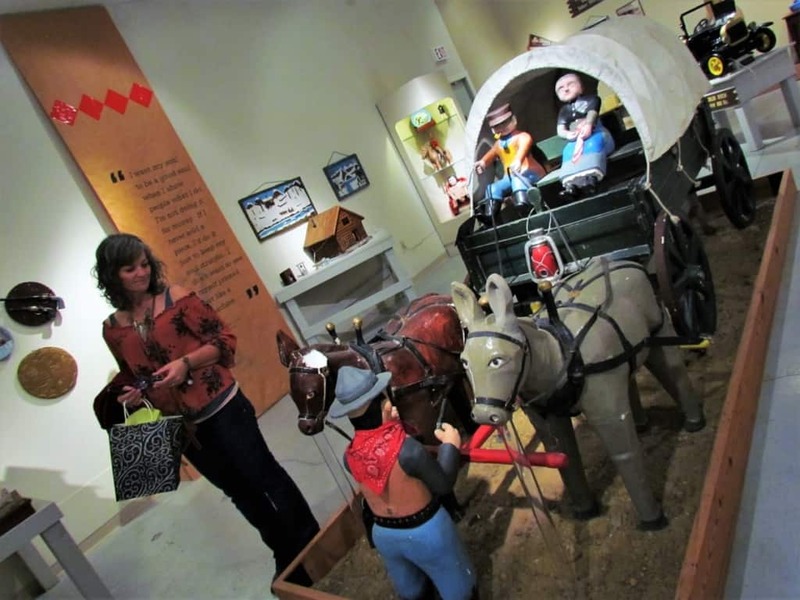 Share this article with a friend who loves folk art! Since my husband was born and raised and Kansas til his college years, I asked him about Lucas. Even he has not heard if this town. But it is artsy! Don’t know what fartsy means. Lol! The whole artsy-fartsy is just a rhyming saying that means they have a large art community. The Grassroots Art Center really looks like a cool place! I love visiting quirky art galleries and houses and this definitely fits the bill. It certainly does. Perhaps you will get a chance to visit. I love artsy but not fartsy places :-). 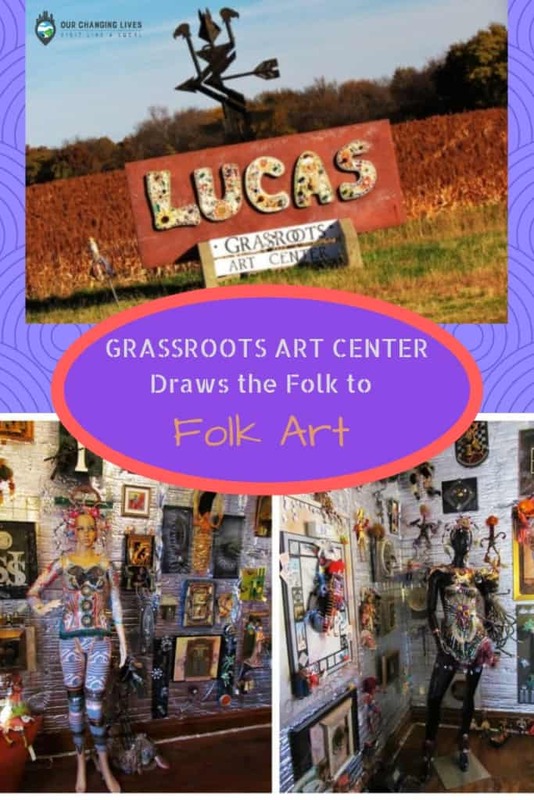 The Grassroots Art Center looks chock full of great stuff and l would definitely love discovering it. It’s great to know Kansas has much to offer! Thanks for showcasing it. Glad you enjoyed the article. We hope you can swing a visit to Kansas sometime. Sounds like we need to plan a visit to the Southwest. I’m definitely putting Lucas on my must-visit list. I just loved learning about all the artists and creativity that’s going on there. We are betting you will find it as interesting as we did. Travel safely! I enjoyed all the pictures of the Grass Roots Art Center. 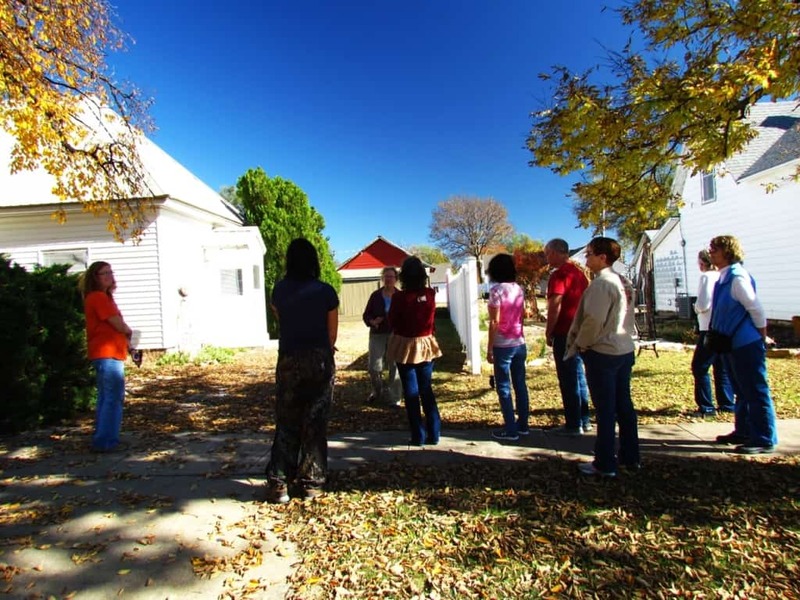 It reinforces the belief in how art can give life to a small town on the plains! The Garden of Eden seems to have been a impetus to carry forward the folk art ideas to this day!! I belong to a group in Buffalo,NY called: University Heights Art Association and we provide art to people that may not take advantage of possibilities otherwise. I will be in KC this summer for a paper doll convention and may be able to come for a visit! We certainly hope you have a chance to make the side trip to Lucas. It’s sure to be intriguing.